National Council for Peace and Order Banglamung chief Maj. Gen. Popanan Luengpanuwat leads a meeting to address a new and continuing round of complaints about cabbies not using meters and ripping off tourists. The army again is threatening to come down hard on Pattaya taxi drivers amid continued complaints about cabbies not using meters and ripping off tourists. 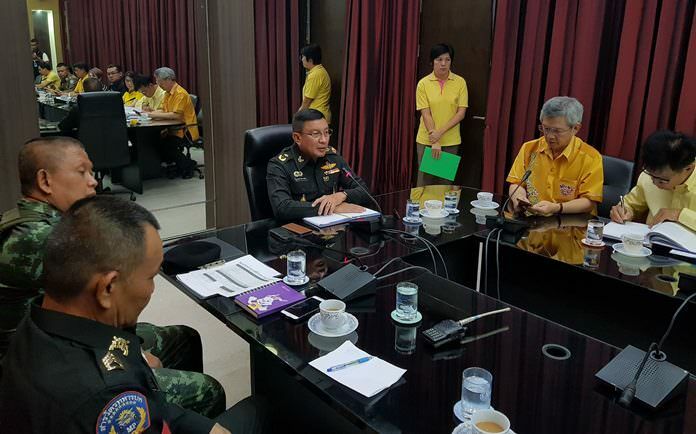 National Council for Peace and Order Banglamung chief Maj. Gen. Popanan Lueng­panuwat, who also heads the Pattaya City Council, met July 19 with police, business leaders and representatives from the Dolphin and Pattaya taxi cooperatives and the Pattaya Baht Bus Cooperative. Popanan said the military will again crack down on metered cabs due to a surge in complaints about rip-offs. Of course, supposed “crackdowns” are common, with the army swearing both in August and March of last year that it would enforce the law and force drivers to use meters. As is always the case with such announcements, they are soon forgotten and things go back to business as usual. Taxi drivers, for their part, also continue to sing the same old song of woe, with a Pattaya Taxi Cooperative official – who wouldn’t even give his name – justifying the illegal no-meter practice. He noted that Department of Land Transport regulations require metered cabs to charge 40 baht for the first two kilometers, six baht a kilometer up to ten kilometers, and 10 baht a kilometer for each kilometer after that. Meters also tick off single-baht charges per minute when stalled in traffic. That translates to a fare of about 60 baht from Central Festival Pattaya Beach to the Pattaya Bus Station in clear traffic. There’s also the steep competition from 10-baht songthaews and the fact there are 500 metered cabs working in Pattaya, he complained. The problem, the driver says, is that Pattaya is relatively small and most people take short journeys. They can’t survive on 40-baht fares, the drivers moaned. Popanan wasn’t offering any tissues to the drivers’ union. Whether they like it or not, the major general said, 40 baht is the law and not using meters is illegal. The army will not allow the practice to continue to flourish, he vowed. All public-transport drivers were to be summoned to a July 26 meeting where the law would be laid down, Popanan said. The NCPO boss did add that officials would take all opinions into consideration and possibly make a recommendation to the Transport Ministry that base fares be raised to as much as 100 baht, as is done in Koh Samui and some other tourist resorts. However, Popanan noted, regulatory changes to public transport is a lengthy process and that current regulations would not allow normal cabs to charge “VIP” rates.